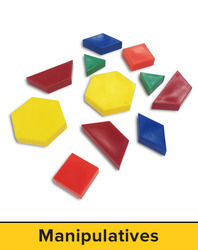 This versatile kit provides the most common classroom manipulatives in magnetic form. It allows students to work in groups to solve problems and show their solutions, and encourages mathematical communication among students. The kit includes: 1 magnetic whiteboard for easy demonstrations; Numerals (20); Symbols (14); Pattern Blocks (49); Money  Bills (24); Money  Coins (45); Base Ten Blocks (31); Two-Color Counters (40); Fraction Circles (51); and Fraction Tiles (51).